Don’t compromise on quality automatic driving lessons in Bedford. Save money in the long run with us. Our average pupil took just 22 hours learning in automatic. The national average is 45 hours. We currently have a fantastic offer for 10 driving lessons = Just £200. We can assure you at Drive Auto Bedford we only use Fully qualified automatic driving instructors in the Bedford area. There are many companies that use trainees, especially national companies. Always look out for a green badge in the corner of your instructors window, if they have a pink one – You need to give us a call and join our first time pass club. 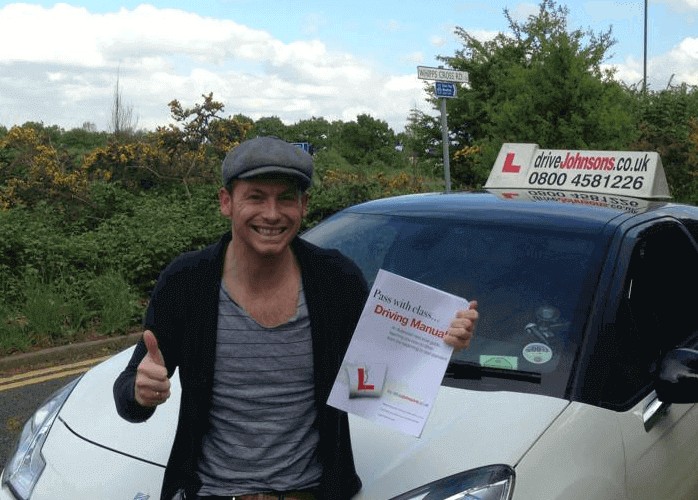 We have many celebrities such as ‘Joe Swash’ coming to learn with our automatic driving school in Bedford. Our first time pass rate for automatic transmission is 91% in Bedford at Cardington test centre. If you’re looking for that fast pass then we also offer intensive driving courses tailored to your needs to give you the best possible chance of passing first time. Automatic Driving Lessons in Bedford aren’t cheap, so we want you to learn as quickly and as safely as possible. When you start your first driving lessons with us, you will receive all of the free resources listed to help you save time, money and give you the best possible chance of passing first time. Free online access to our theory test training, including theory question and hazard perception practice. Book your lessons today before our prices go up!